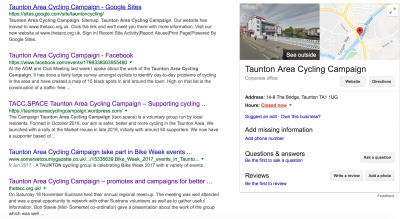 For those of you that have tried to search for the Taunton Area Cycling Campaign website using Google it will come as no surprise to you that only references to the site and not the actual site itself were found. As our supporter base grew it was becoming more and more frustrating that news items and valuable information featured on the website were not being found and viewed. That has now all changed as we launch our new website name which is www.thetacc.org.uk A big thank you to our volunteer web master Paolo who masterminded this change. Unfortunately our promotional material is now out of date so when handing out these items, business cards for example, please point out our new website name. There we are … page one! Also tacc.space directs to thetacc.org.uk, so people will be still able to find us from the old name for a while.